"For a wonderful few days, the pressure of life was lifted"
You may remember in the September e-newsletter we were celebrating the boyfriend shirts created by Helena Christensen with a competition to win tickets to The Clothes Show. The boyfriend shirts were gifted to Thomson Sensatori guests, and a number were sold on eBay with the proceeds donated to the Family Holiday Association. The proceeds of the Helena Christensen boyfriend shirts are being donated to the charity, but how much was each shirt sold for? And if you’re not lucky enough to win these tickets, you can still take advantage of the exclusive rate we organised especially for you. 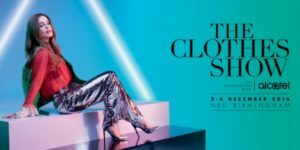 You will be able to take advantage of an exclusive offer to The Clothes Show of 3 tickets for the price of 2 – simply enter the code Thomson342 at the checkout. Purchase your exclusive tickets here. Congratulations to the lucky winner of last month’s competition, Mandy Eldridge, who has won a family ticket to a National Trust place!